A piece for a high quality collection. 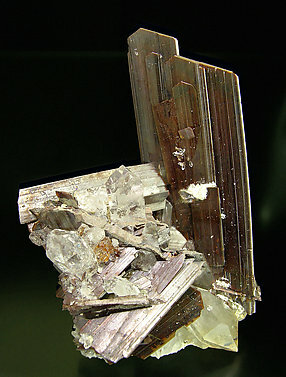 The parallel growth of flat, very big, Brookite crystals, gives the sensation of a unique crystal, of bigger size. 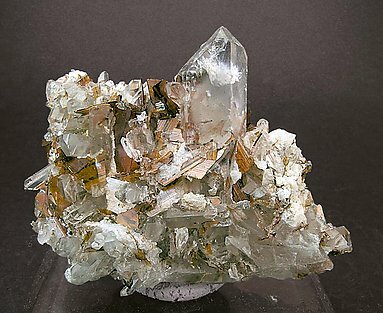 The matrix is a group of Quartz crystals, the dominant one doubly terminated. A very, very special specimen. We must underline the big size of crystals and their magnificent disposition on a matrix of Quartz crystals with inclusions. 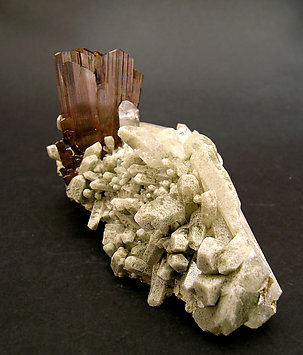 On the base of the main Brookite crystals are some other Brookite crystals. All have complete terminations. A definitive piece. A perfect miniature. 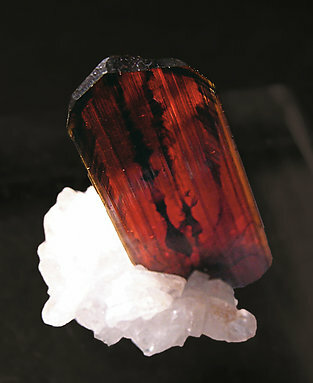 The crystal is doubly-terminated, transparent, and the color, while at first it looks brown, also shows flashes of lively red. The fine matrix of Albite adds an elegant touch. 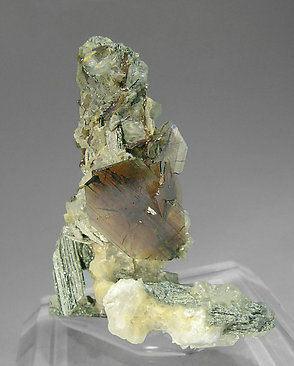 Group of crystals, the main one doubly terminated, on matrix and with Calcite crystals. The specimen has the highest possible quality for the locality. Very sharp laminar Brookite crystals, some of them with fractured edges, something very typical for Dodo mine samples. 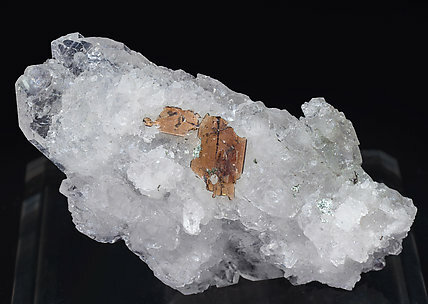 They are on a doubly terminated Quartz crystal, very rich with inclusions and with fibrous aggregates of an unidentified amphibole. 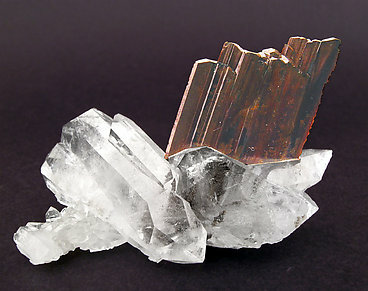 Very sharp laminar Brookite crystals that are transparent and bright with an orange brown color. They are implanted on a group of doubly terminated Quartz crystals with polycrystalline growths. From a classic Swiss locality. 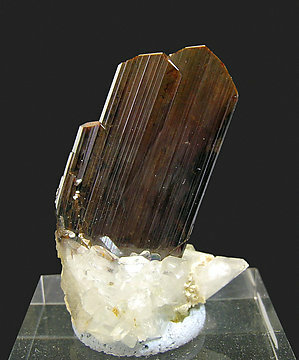 Very sharp and complete Brookite crystal, with an excellent color, luster and transparency. On a Quartz matrix. An alpine collector’s dream specimen. The laminar crystals have great color and the Quartz that they sit on is well crystallized. Parallel aggregate of bright Brookite crystals with deep color and very well defined phantom growths. They are implanted on a matrix of Quartz crystals. More esthetic than usual for Kharan Brookites. Miniature of excellent quality and very esthetic. 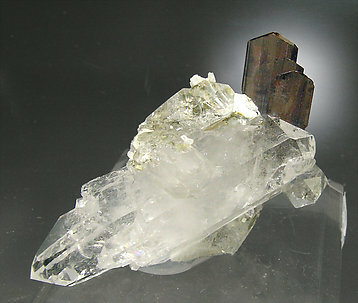 It is a parallel growth of three flat prismatic crystals on Quartz matrix. The crystals are very sharp, with a perfect definition of their faces and edges and are bright and translucent. Parallel growths of bright translucent crystals perfectly defined and free of damage. 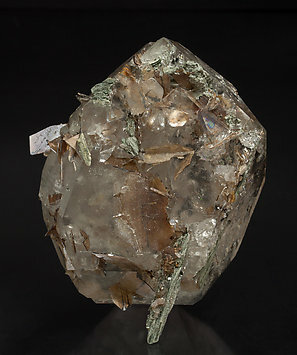 The matrix is a group of doubly terminated Quartz crystals. The sample is really splendid, both for its crystallization and its esthetics. 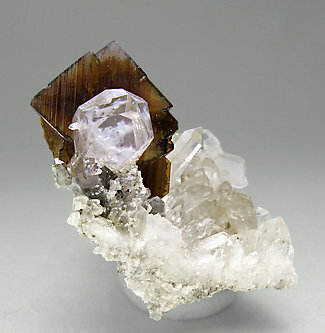 Crystals are tabular, elongated and have very well defined and sharp faces and edges. On the sample there are also some small Quartz crystals. With reflected light it is possible to observe, at the same time, translucency, color and the typical dark inclusions of some Brookites. 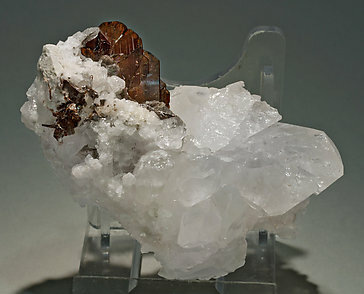 Translucent and of nice color, the Brookite crystals, incomplete but unbroken, sit on a bed of Quartz and Albite crystals. 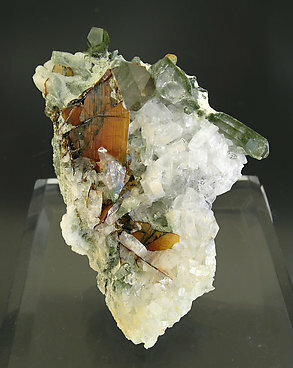 Some of the Quartz crystals have green inclusions enhancing the specimen. 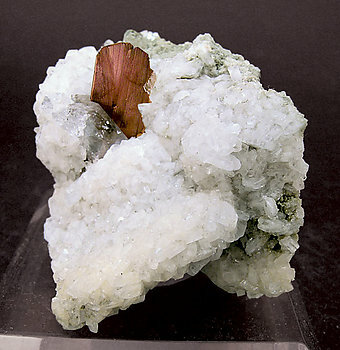 A crystal that stands upright on the matrix of Albite and Quartz. It is laminar, has good color and has well-defined edges. 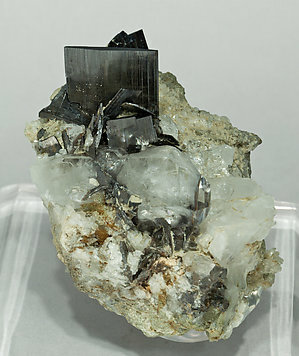 Group of Brookite crystals, one of them clearly dominant, that are very well defined and have uncommon sharp and flat terminations. They are on matrix, with Quartz and small Albite crystals.